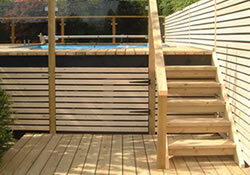 Welcome to All Decked Out – the home of custom made decking. 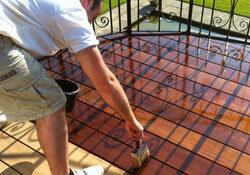 As decking specialists we offer a professional and high quality service, catering for all needs both private and commercial in the Chichester, West Sussex and surrounding areas. A deck is an excellent way to extend the living space of your home into the outdoors while offering a good return on your investment. 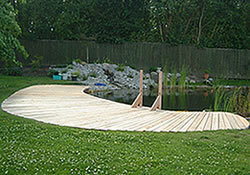 A well designed and well-built deck can enrich your life in ways both expected and unexpected. It can provide a place to get away from it all and relax, a platform for parties or gatherings, or an outdoor kitchen for alfresco dining, and much much more. Unfortunately, many decks are thoughtlessly tacked onto the back of a home and not planned out, leaving them relatively unused and wasted. 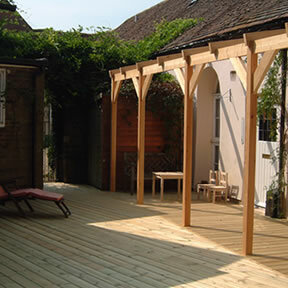 However a carefully planned and designed deck can offer a natural extension to your existing house creating a perfect transition between inside and outside. Here at All Decked Out we offer a great service working alongside you the customer to envision the perfect deck for your garden or property. Once a site survey has been completed a 3D design of your deck and surrounding garden will be supplied if required along with a competitive and affordable quote. Please take some time to look at our gallery to see past and present projects.